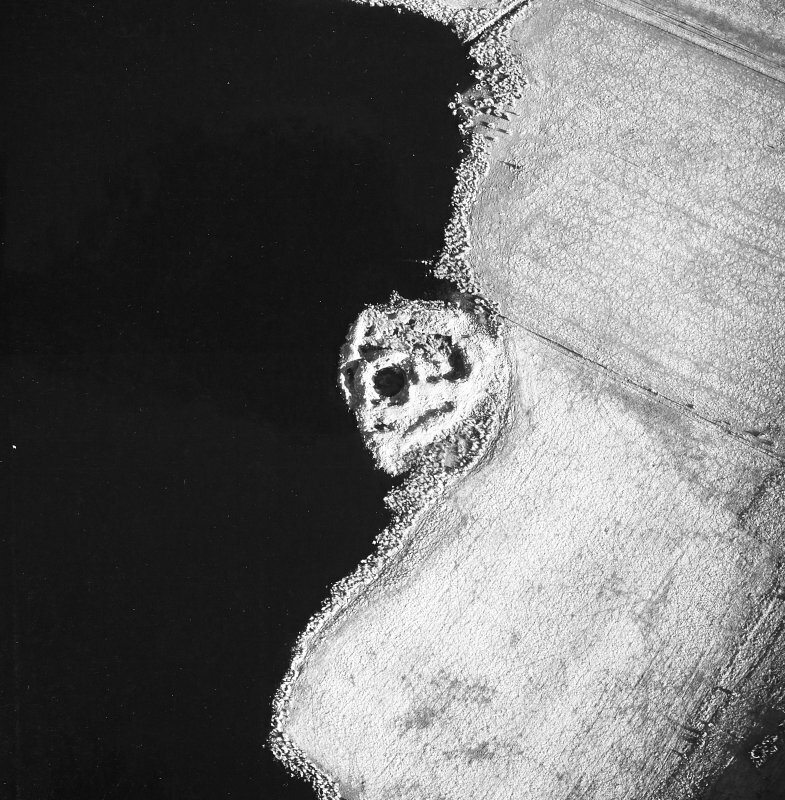 Oblique aerial view centred on the remains of the broch with farmstead adjacent, taken from the NE. 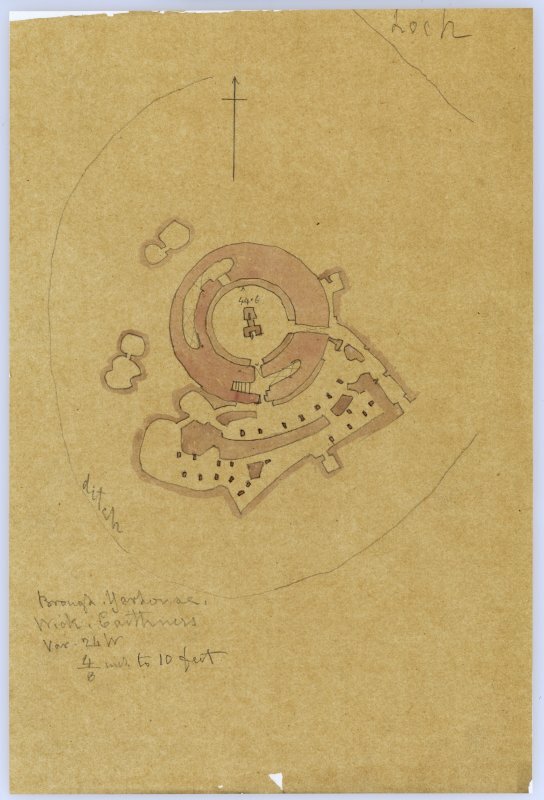 Sketch plan of broch of Yarrows and outbuildings. 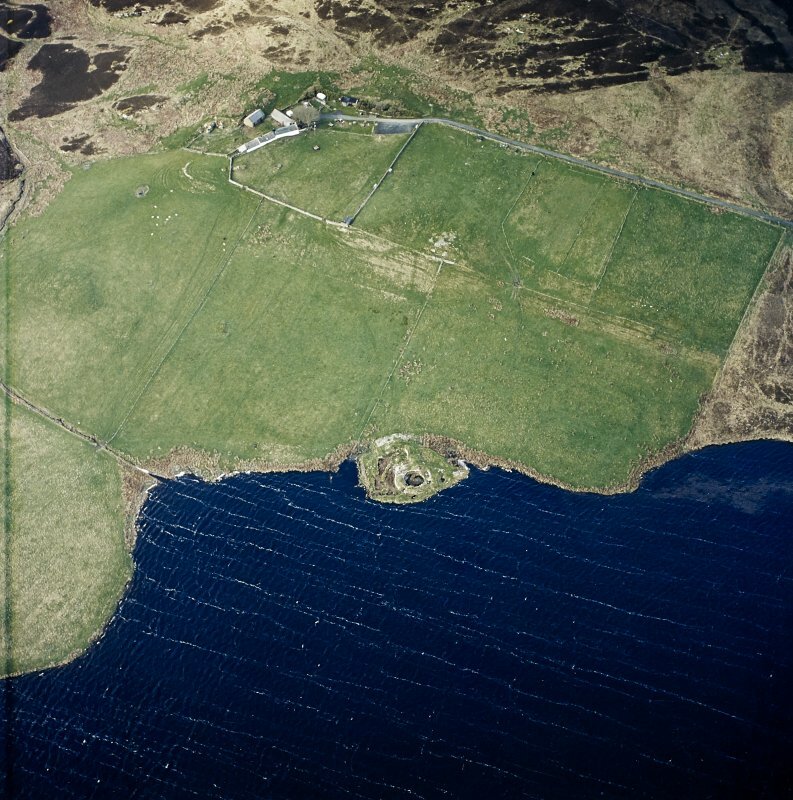 Oblique aerial view centred on the broch and outbuildings. Plan of whole site. H Dryden, August 15, 1871. Copied in colour, 1993. Digital copy of a photograph. 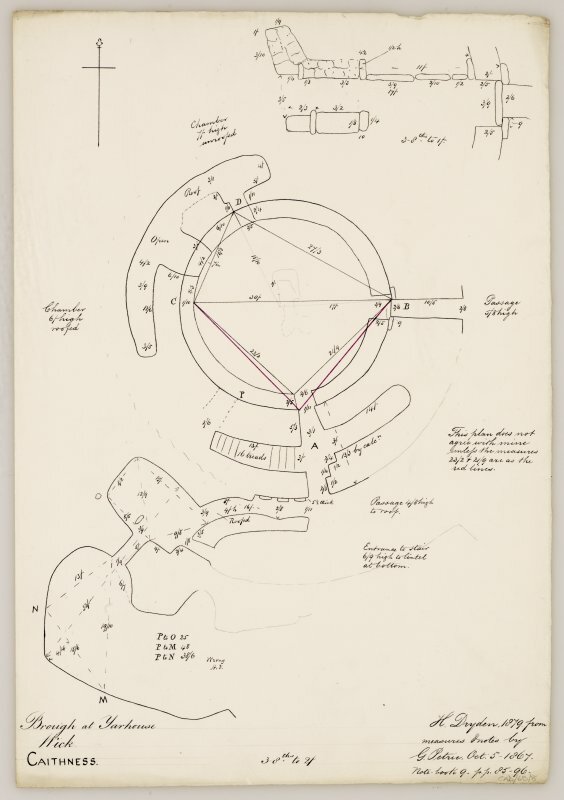 Section through broch of Yarrows and outbuildings. Section and interior features from E. H Dryden, August 1871. Copied in colour, 1993. Digital copy of photograph. 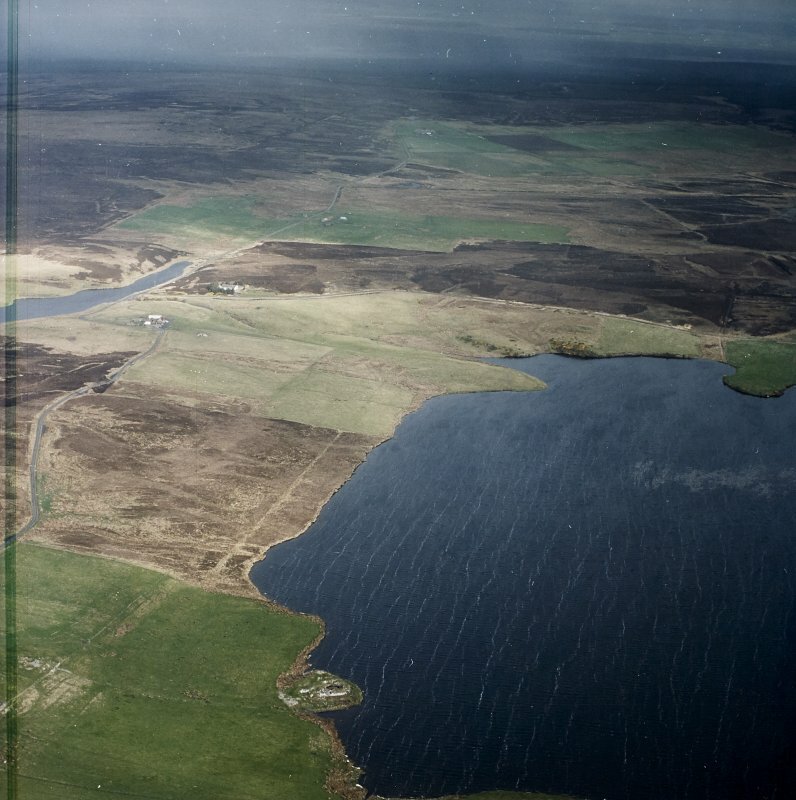 General oblique aerial view looking across the broch and Loch of Yarrows towards Oliclate, taken from the SE. 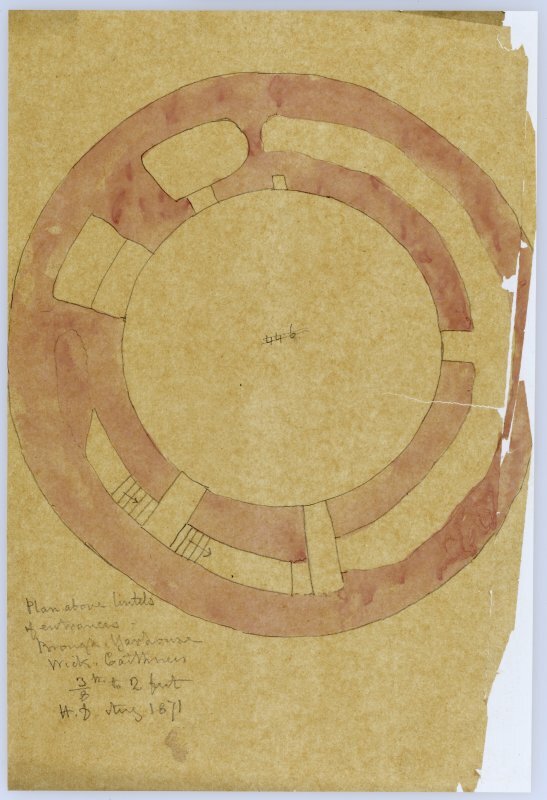 Plan of broch of Yarrows. Detail of broch wall on S side. Digital copy of photograph. 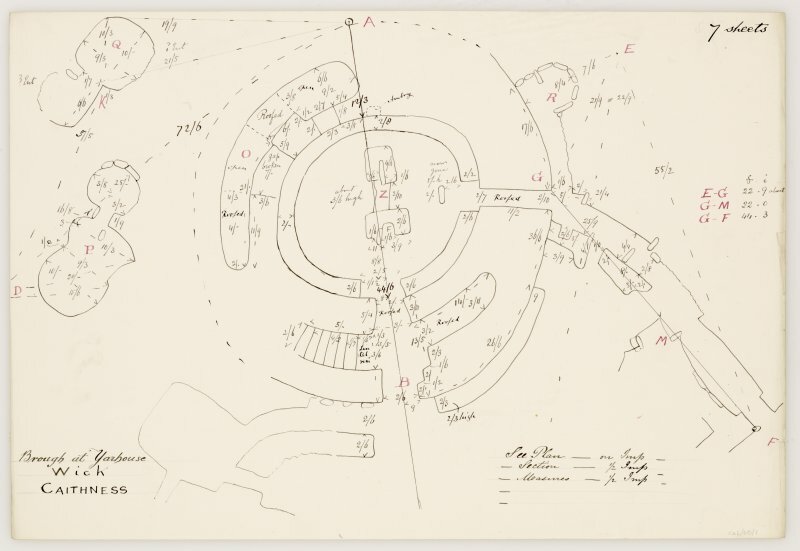 Plan of broch of Yarrows outbuildings. 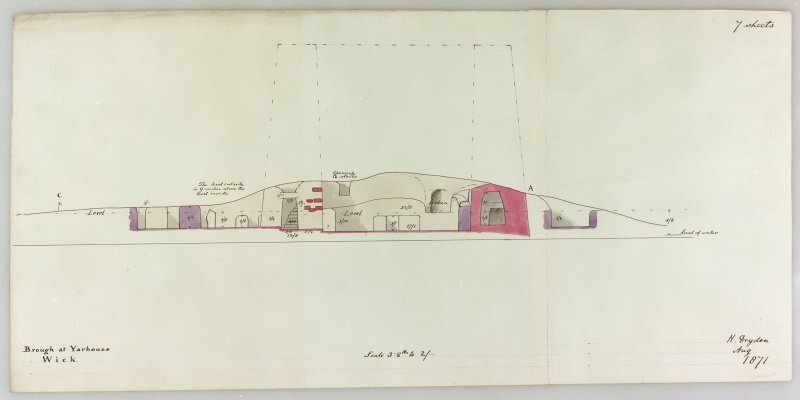 Plan of outbuilding at broch of Yarrows. 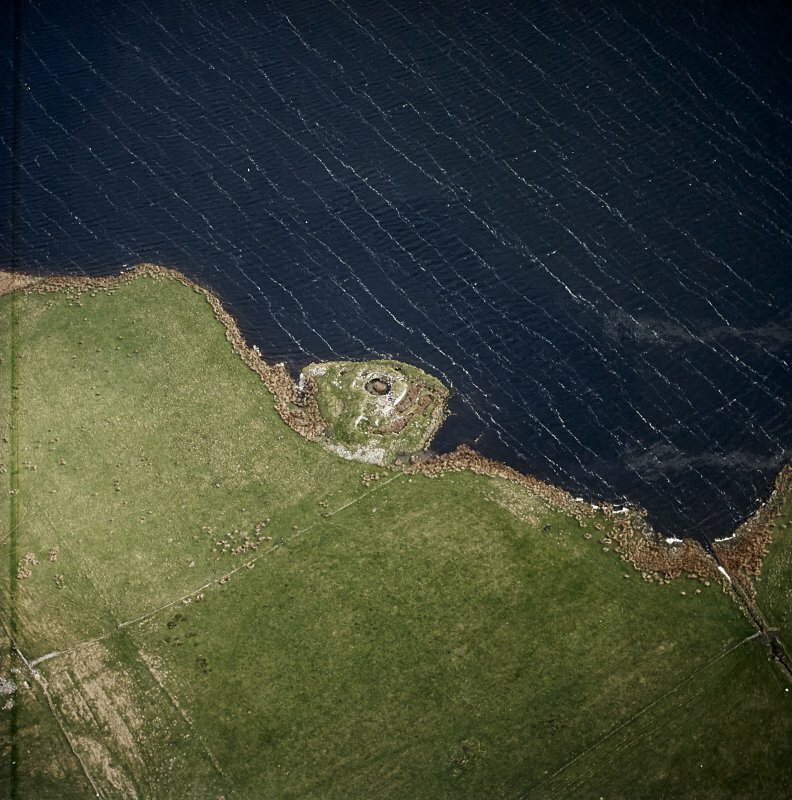 Oblique aerial view centred on the remains of the broch, taken from the SSE. 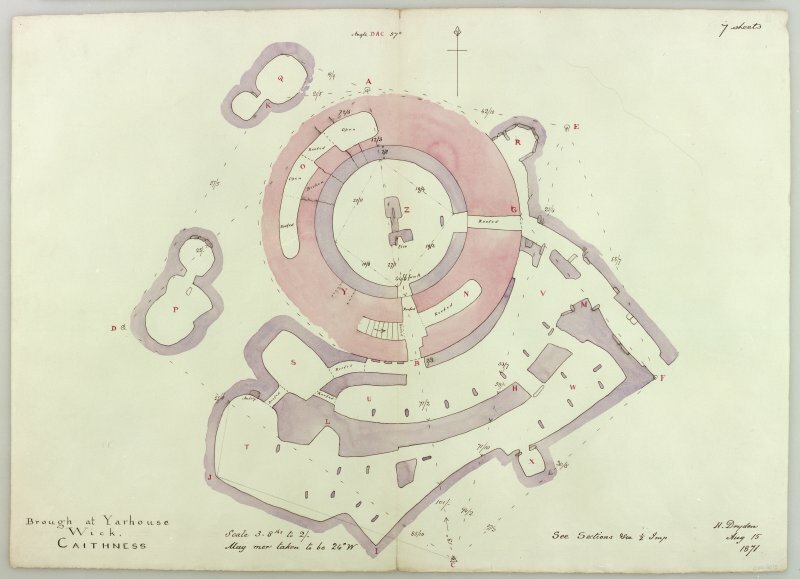 Plan of the Broch of Yarrows. 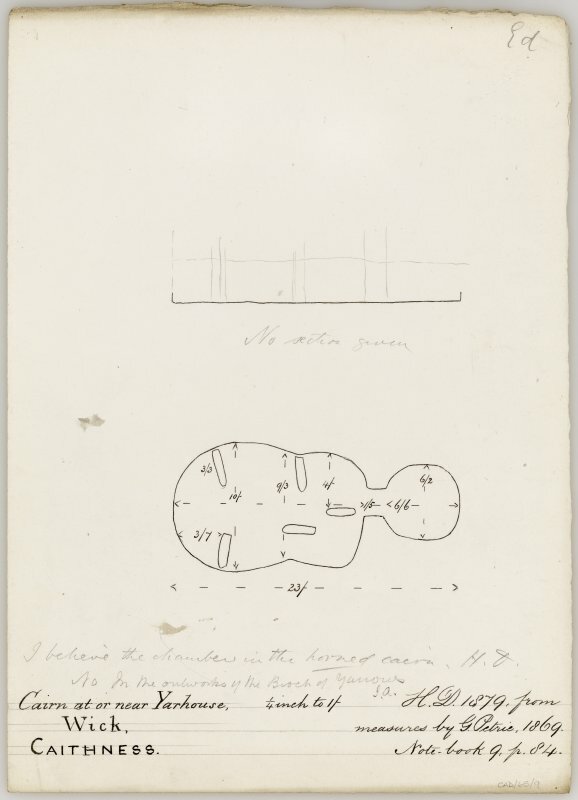 Plans with measurements (3/8":2') and plan of entrance passage (3/8":1') from measurements and notes by G Petrie, October 5 1867. Notebook 9, pp85-96. Digital copy of a photograph. 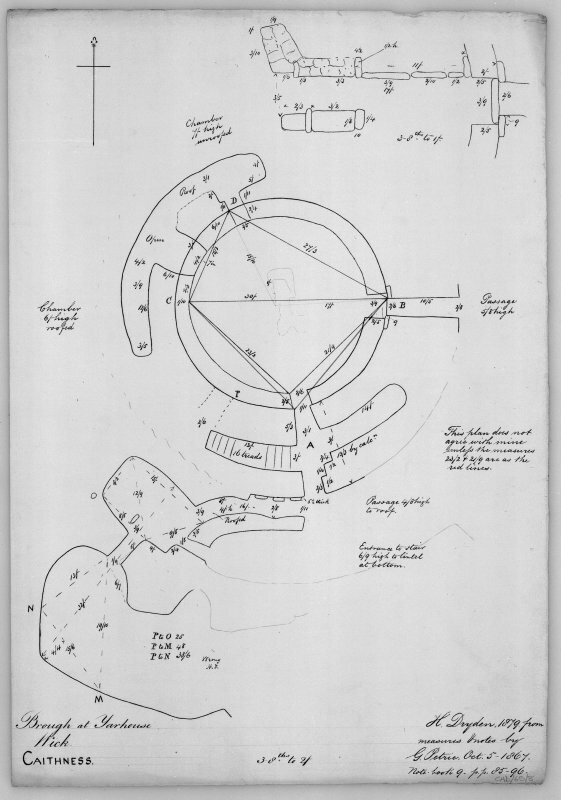 Section through broch of Yarrows. 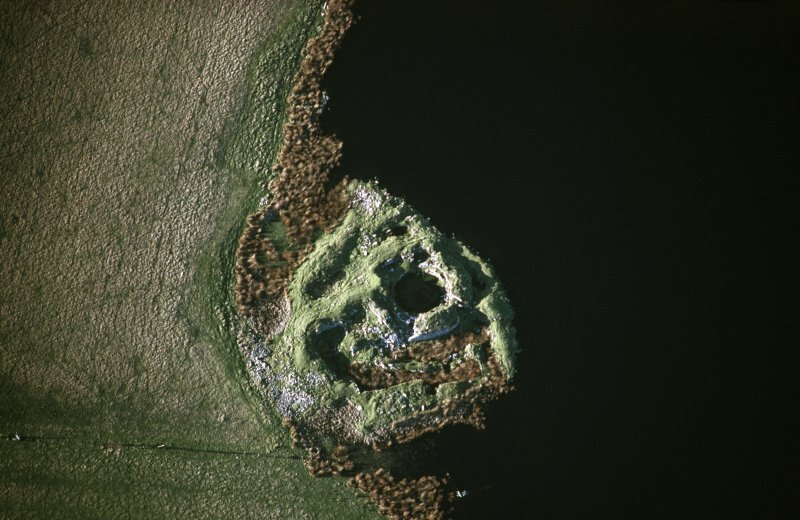 The broch of Yarrows, with secondary structures, including wags, is situated on a spur projecting into the Loch of Yarrows, isolated from the mainland by a ditch 25 to 30ft wide. Before excavation by Anderson in 1866-7 the remains appeared as a grass-covered mound 18 to 20ft high. 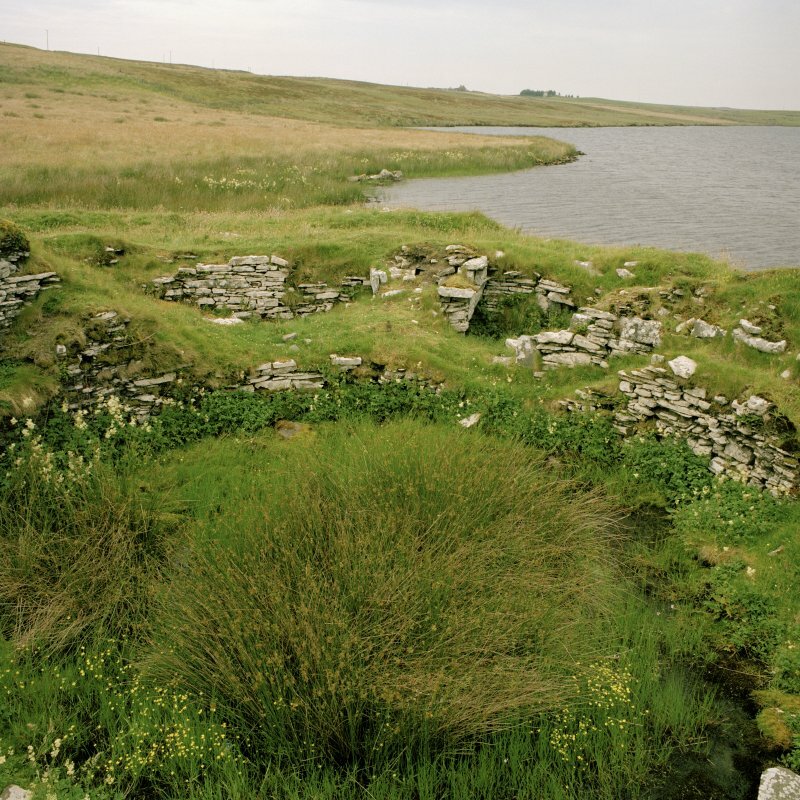 The broch consisted of a circular wall, 12 to 13ft thick and then 15ft high, enclosing an area 30ft in diameter. The relics were presented to the National Museum of Antiquities of Scotland (NMAS). In 1910 the wall stood about 11ft high. Much of the structure was still visible, and the walls of the secondary structures were in good condition. Anderson also found five human skeletons, one with a 13th/ 14th century brass brooch, in the mound. J Anderson 1869; J Anderson 1873; J Anderson 1883; J Anderson 1901; RCAHMS 1911. 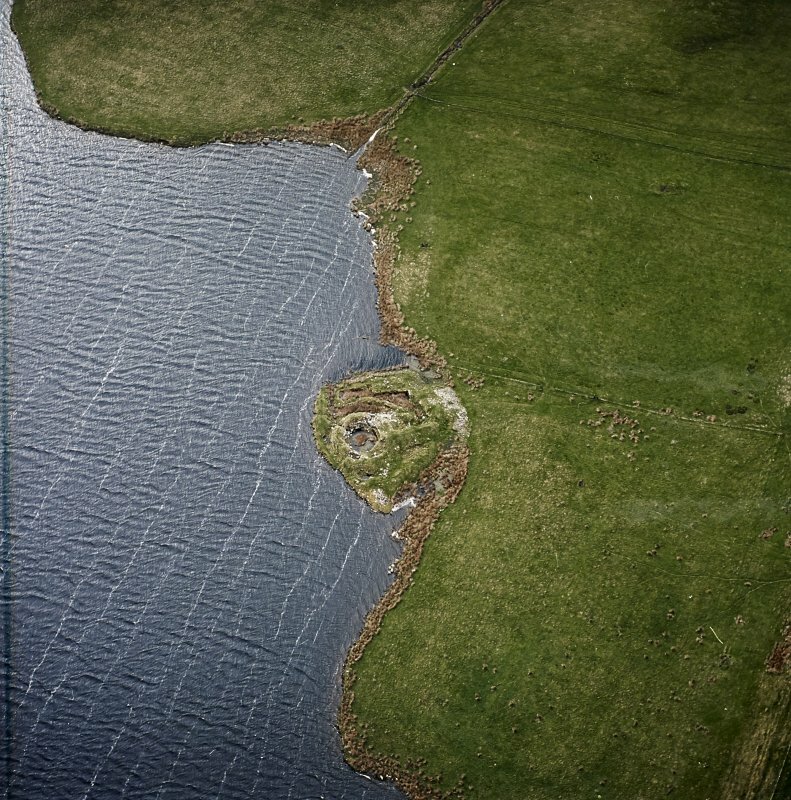 A broch and settlement, generally as described by the RCAHMS, partly waterlogged due to the damming of the Loch of Yarrows. The encircling ditch is now visible as a vague silted-up marshy area. The name 'Cairns of Yarrows' is no longer used locally. This broch is probably an early form. A stretch of lintelled ground-level gallery, unnoted by the excavator, is in the NE arc. The entrance in the E is probably primary, that at the foot of the mural stair probably being pushed through when the settlement outside was being built. A secondary wall has been introduced to the interior of the broch, which is usually an indication that it has been converted into a dwelling and its high wall destroyed. 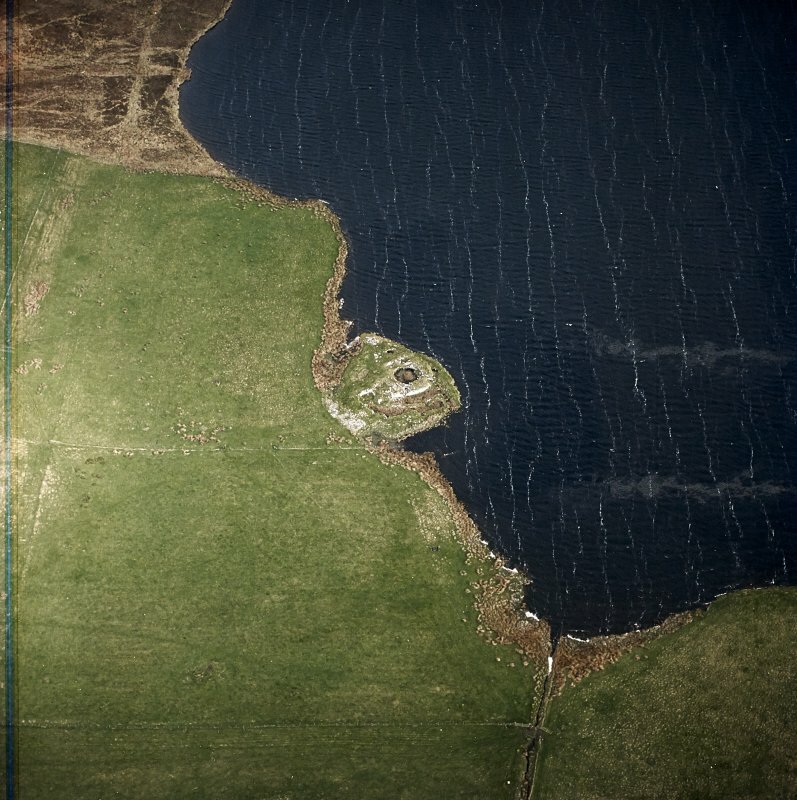 This broch is situated 230m NE of South Yarrows farmsteading (ND34SW 474), on an islet in the SW corner of Loch of Yarrows. The broch, which has been defended on the W and SW by a ditch measuring up to 11.6m in breadth, stands at the centre of a complex of later buildings. The excavation of the broch, as well as some of the other structures, has left a legacy of well-preserved sections of dry-stone wall interspersed with eroding excavation trenches and spoil-tips. The broch (YARROWS04 241) exhibits two main phases of construction, in the first of which it measured a maximum of 10m in internal diameter. The wall, which is up to 4.2m in thickness and at least 2.7m in height, is constructed of quarried blocks laid in horizontal courses. The entrance is on the E and its partly roofed passage measures 3.4m in length. The second phase of construction included the addition of a wall, 0.7m in thickness and at least 1.5m in height, lining the inner face of the broch, reducing its internal diameter to 8.6m. In places, the height of this wall appears to rise and fall to take into account the entrances into the intra-mural cells and stair. On the S side of the broch there is a doorway that leads into a short intra-mural passage, which is still partly roofed, with three relieving lintels visible; to the E this passage leads into an intra-mural cell and to the W, a stair. The intra-mural cell is roofed and measures 4.1m in length by 1.2m in width and up to 2m in height. The intra-mural stair survives to 2m in height, apparently rising in stages, with a set of four steps at the bottom separated from a further set of two treads towards the top. The S side of the passage, which includes a section of the outer wall-face of the broch, has been broken through, possibly to provide access to the interior of the broch by the builders of the adjacent, post-broch structures. Two further intra-mural cells on the NW side of the broch are entered from the interior of the broch. Outside the broch on the S the walls of a number of excavated structures can be seen (YARROWS04 245-249). The presence of angular and curvilinear lengths of wall suggests the presence of both square- and round-cornered structures, probably indicating different periods of construction. As they survive today, these structures appear as two broad, concentric arcing hollows, defined on either side by dry-stone masonry and divided by walls constructed of a basal course of edge-set slabs carried up in laid courses. Both Dryden (1871) and Anderson (1873) illustrate these structures as long buildings containing central aisles flanked by freestanding upright slabs, but only a single upright flag was located during the course of the RCAHMS survey. 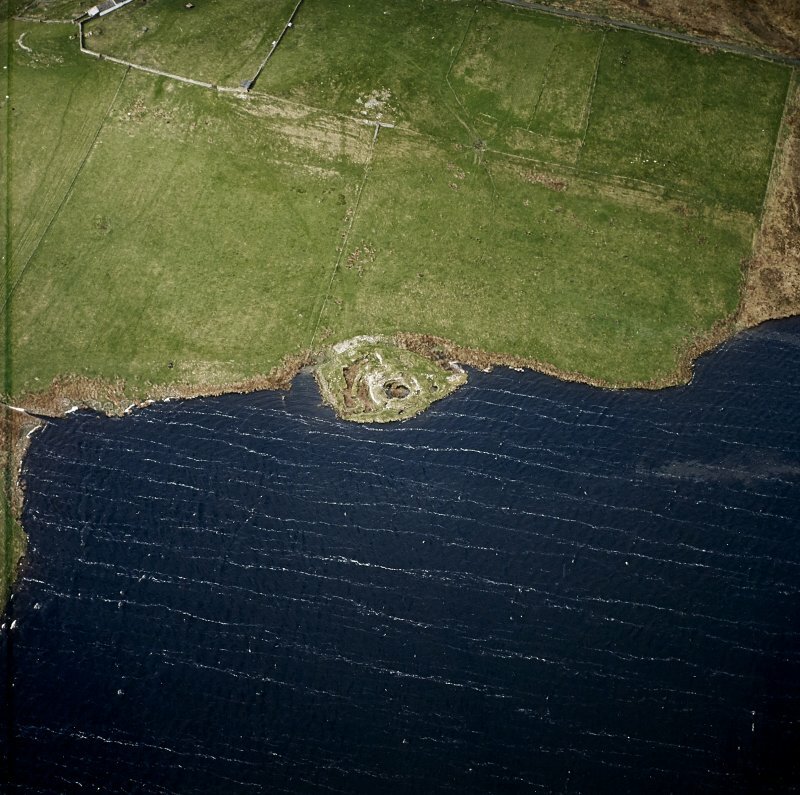 Two bi-cellular buildings (YARROWS04 242 and 243) are respectively situated immediately NW and W of the broch, where they appear to have been sunk at least 0.6m deep into the shoulder of the grass-grown mound of rubble that now surrounds the ruined tower. The larger measures 7.6m in length by 3.3m in breadth within dry-stone walls. What may be the remains of a third bi-cellular building is marked by a slight rubble-filled depression between the other two. An eroded excavation trench is visible outside the broch on the NE, where another dry-stone structure (YARROWS04 244) has been set against the outer face of the broch. What are probably two piles of excavation spoil stand at the NW and SW extremities of the islet; the latter has probably been augmented by more recent field clearance. 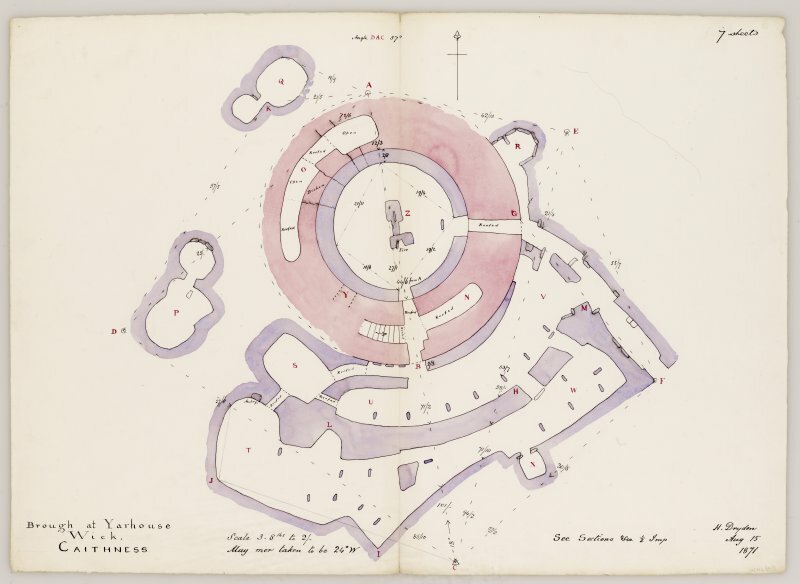 Dryden 1871 Plan of Broch of Yarrows. ND 3083 4349 Diving around the submerged stonework in the loch adjacent to Yarrows broch (ND34SW 1) recorded two large linear stone structures. The first of these ran parallel to the current shoreline and consisted of horizontally coursed stonework which appeared to act as a revetment to the rubble behind. The exact purpose of this feature is unclear but it is possible that it acted as a dock or harbour. The second structure was in c 2m of water at the time of survey and was built from edge-set stones extending into the loch as a pier or jetty. Both features were recorded. 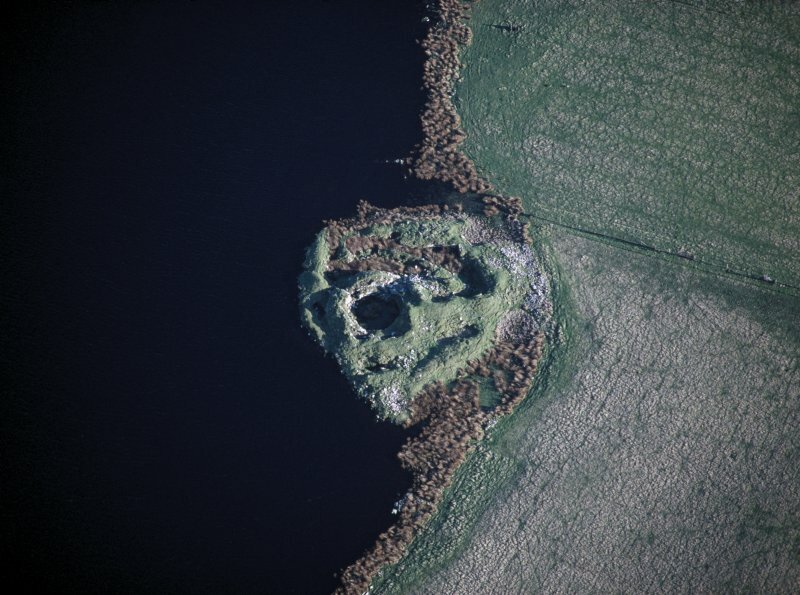 This ground-galleried or transitional broch stands at the foot of a shallow slope on a very short, blunt promontory projecting into the Loch of Yarrows (visited 14/7/63, 10/7/85, 5/8/02 and 23/7/03). Originally a conical grassy mound 5.49-6.10m (18-20ft) high, it was excavated by Dr Joseph Anderson in 1866-67 on behalf of the Rhind Committee of the Society of Antiquaries of Scotland. His description of the results is regrettably brief, even by the standards of the time, but useful information can still be gained from examining the extant remains, even though these are partly hidden by falls of stone-work after 1867 (no consolidation appears to have taken place). The central court is now often flooded by water from the loch which was raised by a dam some time after Anderson's work. No exploration of the high surviving wallhead seems to have been carried out; thus without uncovering the remains further we cannot know whether there were any upper galleries, although – for reasons given below – it seems highly likely that there were. The relatively good preservation of the buildings at Yarrows means that the broch and its accompanying buildings are a prime candidate for re-excavation and consolidation. A broad ditch runs round the landward side of the site and presumably once formed a moat connecting with the waters of the loch; one would expect a wall to have been built around the inner edge of this ditch but no clear traces of one have been located. The broch itself is near the shore of the loch and a number of buildings stand in the enclosed courtyard to its west, east and south; the most extensive set are on the southern side where the distance between broch and moat is greatest. 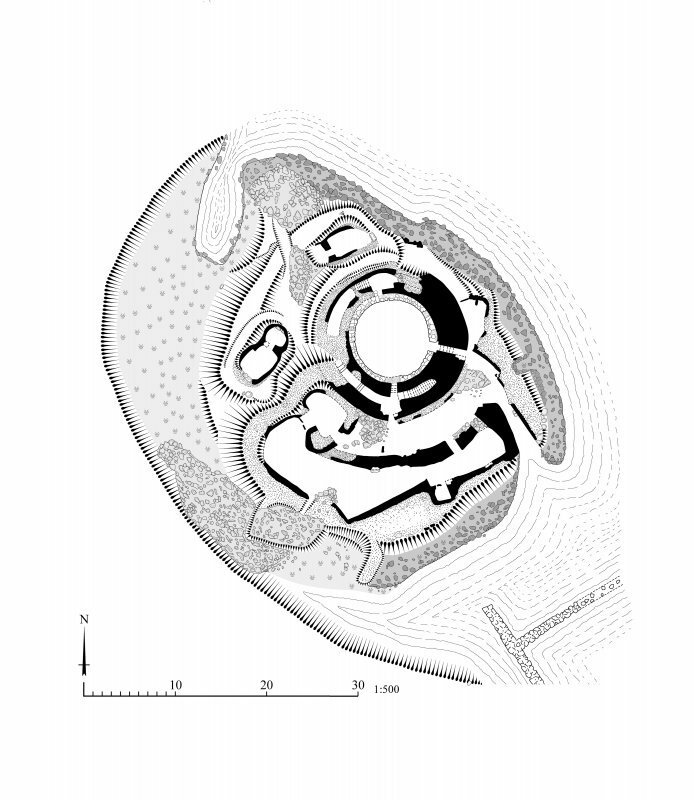 The broch was found to have two entrances, one facing south and one just south of east; for reasons to be explained shortly the latter is taken to be the primary entrance and all clock face positions are given in relation to this. The secondary one on the south, at 9 o'clock, had a long mural stair rising from its left side (looking in). Opposite this is what looks like a long stair-foot guard cell, or mural gallery, at ground level, running back towards the primary entrance. On the west side of the court – at about 2.20 o'clock (not 1 o'clock as on Anderson's plan) – is a doorway to a long mural cell or length of gallery which Anderson shows as extending on either side of this opening. At the right end (clockwise) from this doorway the gallery expands into an oval cell at about 3 o'clock. The wall between this point and the eastern doorway is shown solid on his plan. 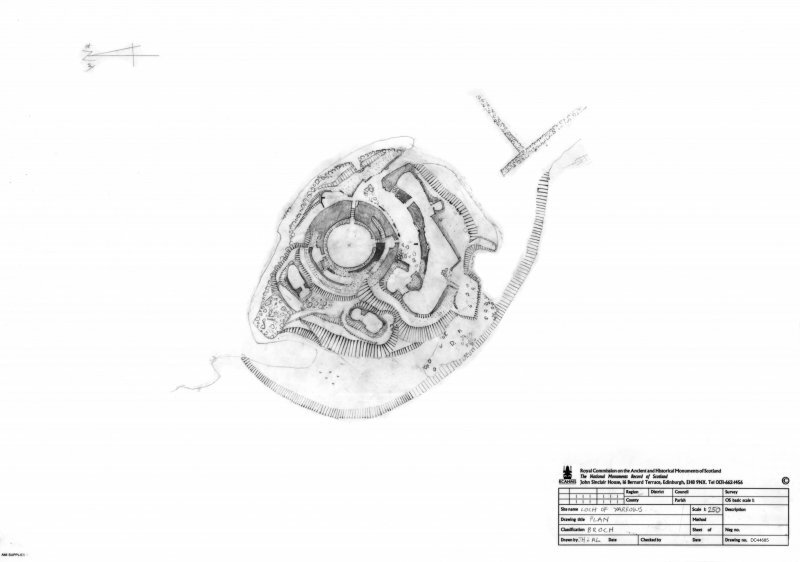 However Mercer's plan suggests that the oval cell has its own doorway (at about 2.30 o'clock) and no opening at 1 o'clock is shown. This is more or less what can be seen now except that the doorway at 2.30 o'clock evidently has a heavy stone sill raised at least 60cm above the primary floor. It is assumed that Anderson's position for this doorway is wrong. A secondary wall has been added to the inner face of the broch wall, leaving openings to reach the three doorways mentioned. Another lines the outer face, but apparently only on the southern arc (anti-clockwise from the entrance), but it is difficult to make out the details of this now. There are other constructions in the central court none of which can be traced now. There is an inward extension of the main (eastern) entrance which has also been prolonged outwards in a long curving passage which also gives access to the long chamber running along the outer wall of the broch (below). This is one of two long stone enclosures, containing rows of upright orthostats, which are adjacent to the broch on its eastern and southern sides; three small chambers were found on the other sides. There is no mention of a scarcement on the primary inner wallface. Five later burials were found in the topsoil at the start of the work. One was 75-90cm (2.5-3.0ft) beneath the surface and the skull of another in a similar position. A third was in the upper part of Chamber E in the outbuildings, together with a bronze brooch with a Christian inscription [5, fig. 195], while a fourth was found in Chamber G, north-west of the broch. When first exposed the broch wall stood up to 4.58m (15ft) high in places ; presumably this refers to the wall core and the actual wallfaces were lower, as they are now. The eastern entrance was then lintelled and about 1.83m (6ft) high and 81cm (2ft 8in) wide, exceptionally narrow for a broch; the length of the primary passage according to measurements made in 2003 is 3.56m (11ft 8in) ( Anderson's diagrammatic plan shows this passage to have been a little shorter, at about 3.05m (10ft)). No guard cell or door-frame is visible either on site now or shown on Anderson's plan. The designs of the inner end of the main entrance and of the doorway to the stair are typical of broch architecture and this – with the landing at the top of the stair (below) – is the main reason that this structure has been classified as a broch, rather than only as a probable example. The internal secondary wall is here about 1.02m (40in) thick so the total length of the passage at present is almost exactly 4.58m (15ft). On the original plan this overall length is about 3.81m (12ft 6in) so one must infer that this was a sketch plan rather than an exact survey. There is also a discrepancy between this plan and Mercer's over what is shown in the north-west arc. 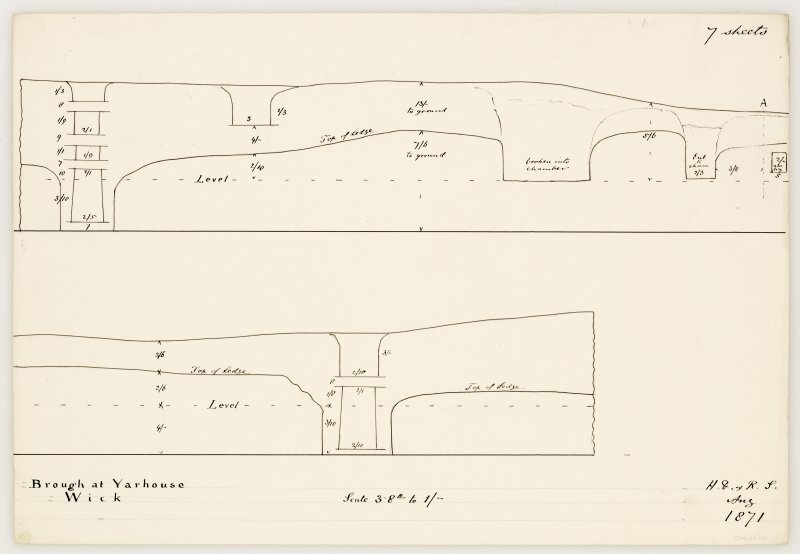 The 1867 plan also seems to show the eastern passage lined on both sides with very large stone slabs, up to 2.44m (8ft) in length, but these are not visible on site and must be a draughtsman's idiosyncrasy. The absence of a door-frame suggests that the long 'slabs' are a device to show that the original passage walls were lined with later masonry, to match the secondary extensions inwards and outwards . The other primary doorways lack this feature. A drawing based on a photograph taken at the time of the excavations, or soon afterwards, shows the inner end of this passage as it was when first exposed; there is a well-preserved chamber above the lintel, itself with a door-sized opening to the interior [5, fig. 196]. This leaves no reasonable doubt that this passage is the primary broch entrance and it ought to have been equipped with the usual features, now invisible. Only a fragment of one wall of this Level 2 chamber remains but – with the photograph – is enough (with the design of the intra-mural stair – below) to show that Yarrows is the stump of a hollow-walled tower. What were thought by Anderson to be the checks for a door were found 11ft (3.36m) from the exterior but these were certainly formed by the junction of the original passage with the slightly wider inward extension through the secondary wall; they are not a primary feature. The passage was also continued outwards at some stage to lead into the pillared outbuilding Chamber C. Thus this exterior chamber and the broch interior would seem to have been in use at the same time. Assuming therefore that the eastern entrance was the primary one, the other entrance, facing south, is at about 8.30 o'clock and it also forms the doorway to the mural stair which rises to the right from its west wall. The Commission's account does not mention that this passage goes right through the wall . The sill of this passage, at its inner end, was reported to have been found raised 60cm (2ft) above the floor of the court, though this is not at all obvious now and no sill is marked on the original ground plan. It seems probable that Anderson mixed up his notes on this doorway with those concerning the raised doorway at 2.30 o'clock (below). Moreover when it was first exposed there were several lintelled voids above the inner end of the south doorway [5, fig. 197], and these are highly characteristic of an internal opening in a tall broch which leads only to an intra-mural feature; the lowest of these voids is still visible. All this confirms that the outer part of the south doorway was not part of the original broch design but was pushed through this thin part of the outer wall later, presumably after the high galleried wall had been substantially pulled down. Mercer  argues that the entrance here was original because the broch wall widens substantially at this point to 4m (13ft 4in) [6, fig. 58] as if to accommodate it (the Commission says the stair is only 90cm (3ft) wide ). However this could as easily have been designed to accommodate the base of the stair which is in an unusually wide passage (about 1.3 m, or 4ft 4 in, across) [7, fig. 58]. Originally sixteen steps of the stair remained – extending about a fifth of the way round the broch – but most of these are now hidden by debris. 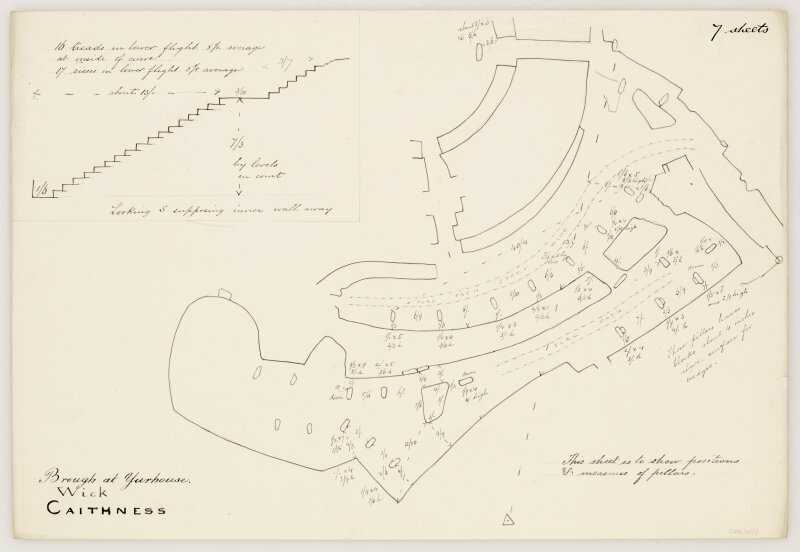 There are however clear indications of a landing starting 4.98m (16ft 4in) from the near side of the stair door; the next flight appears to start about 0.92m (36in) further along; the 19th century plan suggests such a landing by a gap in the steps and this is mentioned by Anderson who also refers to a 'light-hole' there, looking into the interior (though this is not shown on his plan). Moreover a huge flat slab forms part of this landing, its inner edge being flush with the interior wallface; it is only a few cm higher than the topmost step of the first flight. This looks like the sill of a large raised doorway leading out from the landing into the central court, about 2m above its floor. If the purpose of the aperture was only to admit light it would probably have been one of a series of fairly low voids and there would have been no need for a landing in the stair; such a feature elsewhere indicates a full-sized doorway. Thus the stair landing appears to have given access to a wide, raised door to the interior and one would therefore expect a scarcement ledge level with this sill, supporting a high, wooden raised floor. However none is now apparent on the small amount of masonry preserved above this sill; this remains to a height of about 2.44-2.75m (8-9ft) here. A long, lintelled stair-foot guard cell runs round from the southern doorway towards the entrance, almost at ground level as far as can be seen. In view of the design of the rest of the wall it might be regarded as a length of basal gallery 3.97m (13ft) long. It is 1.12m (3ft 8in) wide and partly corbelled longitudinally; in other words the sides converge slightly as they rise. The lintelled roof is 1.88m (6ft 2in) above the floor. These lintels seem to confirm that this is a ground-level wall gallery and they should form the floor of the gallery of Level 2, part of which might still be preserved under the rubbish on the wallhead here. This could be yet another piece of evidence for Yarrows having been a high, hollow-walled broch. At about 12.30 o'clock Anderson's plan shows the doorway to an elongated mural cell of which the lintels of one end can still be seen; the secondary wall is shown as leaving a gap in front of this doorway. Mercer's survey conflicts with this picture and shows this doorway as further round to the right, at about 2.30 o'clock; it also shows the secondary interior wall facing as blocking this off. Mercer refers to this secondary wall as a “scarcement wall”, following Anderson, even though the latter was writing at a time when the importance of the ledge on the primary broch wallface was not appreciated. It is this primary ledge which is now called the scarcement, and has been for many years. The solution here is that the doorway is a raised one (leading directly to the 'cell') with a massive sill which could be as much as 60cm above the interior floor; the sill stone is shown on Mercer's plan. Contrary to what Anderson's plan suggests the sides of a gallery can be traced a short distance to the right of the expanded section, or 'cell'. Immediately to the left, or anti-clock-wise, of this raised doorway there are several massive lintels on edge under which the gallery can be seen to run; neither this section of exposed gallery nor its covering lintels are shown on Mercer's plan so it may be a fairly recent exposure. The gallery then continues anti-clockwise to about 12 o'clock where it is obscured; no built end can now be seen so it may run right round to beneath the stair, making Yarrows close to a ground-galleried broch in design. In addition to the presumed insertion of a new entrance at the foot of the stair already mentioned other clear signs of secondary alterations to the broch were found. A wall up to 75cm (2ft 6in) thick, and up to 2.44m (8ft) high when first exposed, had been added against the inner face of the broch wall. Its base was found to rest above the level of the bottom course of the latter, and on top of 30-35cm (12-14in) of debris which must already have accumulated in the interior. This added wall is clearly visible in the drawings (taken from contemporary photographs) of two of the primary doorways [5, figs. 196 and 197]; their edges have been shaded here. Gaps were left in this secondary wall in front of all three doorways. There were also partition walls across the interior, built partly of long slabs on end, some up to 2.44m (8ft) high. The secondary wall rose to the same height when first uncovered and the slabs may possibly have been roof supports connected with it. There were several outbuildings on the landward side of the broch and enclosed by the outer ditch. Two of these were unusual long chambers (Anderson refers to them, slightly confusingly, as “galleries”) with rows of orthostatic stone pillars set upright in their floors and at right angles to their long sides; these pillars were presumably roof supports, and they strongly resemble the pillared longhouses found at the Wag of Forse. When first exposed the side walls remained intact up to a height of 3.0m (10ft) with no sign of any overlapping for a corbelled roof. The south entrance through the broch wall, at the foot of the stair, leads into one of them. Some of the walls of these massive external structures are still standing quite high. Anderson assumed that these out-buildings were secondary constructions built around the broch because of the similarity between their orthostatic pillars and those inside the broch, which he thought had been added later. Mercer confirms that the north side of pillared longhouse C rests against the broch outer face and is of inferior masonry . The long, curved passageway – also presumably secondary – running up to the main entrance of the broch also gave access to this longhouse a short distance in front of the broch door. The structure of the broch of Yarrows seems to be different to that of most of the other exposed Caithness brochs in that it has considerable lengths of mural gallery at or near ground level, though the wall from 2-5 o'clock arc may be solid. This gallery, together with the relative thinness of the primary wall, may give Yarrows a stronger architectural affinity with some of the brochs of the Western Isles, particularly of Skye, than with its northern neighbours (except for Brounaban). However the finds show that this affinity was not shared by the associated material culture, although the single cordoned sherd looks like a Hebridean style. The two entrances are also unusual and have parallels in other local brochs such as two of those at Keiss (ND36 6 and ND36 7). Moreover the intra-mural stair rises from one of these 'entrances', in a similar manner to the ancient dun at Forse (ND23 14). However whereas the stairs in the Keiss brochs started from the primary entrance passages – and could therefore be argued to be showing influence from the probably earlier local architectural tradition seen at Forse  – there is little doubt that at Yarrows the entrance at the base of the stair is a secondary one, continuing the stair doorway through the outer half of the wall; it was presumably inserted after much of the high hollow-wall had already been pulled down. The early photographs of the two interior doorways, already described [5, figs. 11 and 14], make it quite clear that the doorway to the stair was originally just that. A good parallel for a second doorway being pushed through the wall at the base of the stair – again presumably after extensive demolition of the upper parts of the tower – is to be seen at Clickhimin in Shetland. If the internal floor was re-exposed a central hearth might be found (though none was mentioned by Anderson), as well as a ring of post-holes for the support of a raised wooden floor. These last two features are inferred from the design of Level 2 (below). The narrowness of the primary entrance (81cm) and the absence of any indication of a door-frame demands an explanation. In no other broch the primary entrance of which is exposed can it be shown to be of this design. Even though there are no obvious signs of this now the possibility must therefore be considered that both sides of the passage were skilfully re-lined with dry masonry and that the door-frame – complete with checks, bar-hole and socket – may still be preserved behind the (as the pivot stone may be hidden under secondary paving). Whether such a lining was inserted in Iron Age times or after the 19th century excavations is not clear (the hypothesis could easily be tested by re-clearing the passage floor and examining its relationship with the present passage walls); the former seems much more likely as the passage could have been narrowed when its inward and outward extensions were built. Also Anderson’s plan suggests that the lining already existed when the passage was exposed. There are a few clues to the nature of the second storey of Yarrows. In 1910 the stairway still had twenty-three steps preserved with a landing about two thirds of the way up (Anderson's plan clearly shows the landing with sixteen steps below it and six above it). What the original plan does not show is the floor of a void or doorway looking into the interior of the broch at the level of the landing; the massive sill of this doorway is only a little higher than the lintels of the entrance passages. This important feature can easily be traced now, as explained earlier. Normally the landing would indicate the height of the scarcement on the inner wallface, and the opening would have given access from inside the wall out on to the raised wooden interior floor resting on the scarcement. However no ledge is apparent at this level and the internal wallface goes up at least 60cm higher. 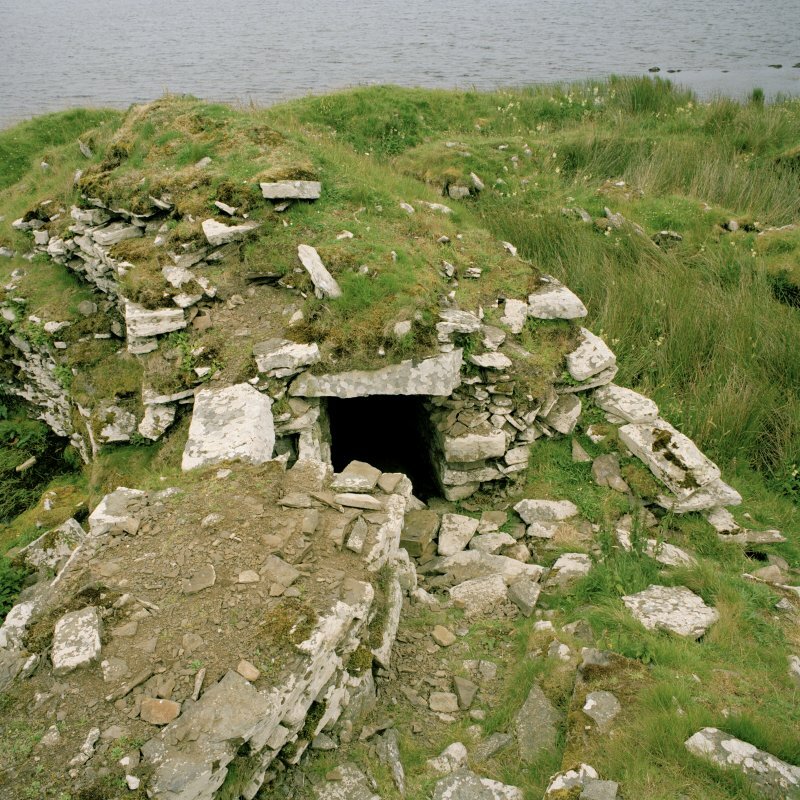 A large raised doorway opening to the central court away from a scarcement is very rare in brochs; Mousa (HU42 6) provides one obvious parallel. One could perhaps assume that the scarce-ment at Yarrows was at the base of Level 3, as at Midhowe and Gurness (HY33 1 and HY32 2), and that there was a second landing with a doorway leading out on to this – but the raised doorway at a lower level is still rather a puzzle. An alternative explanation is that the small part of this high part of the inner face which survives was reconstructed after the excavation without the remains of the ledge being noticed, but there are no obvious signs of this. 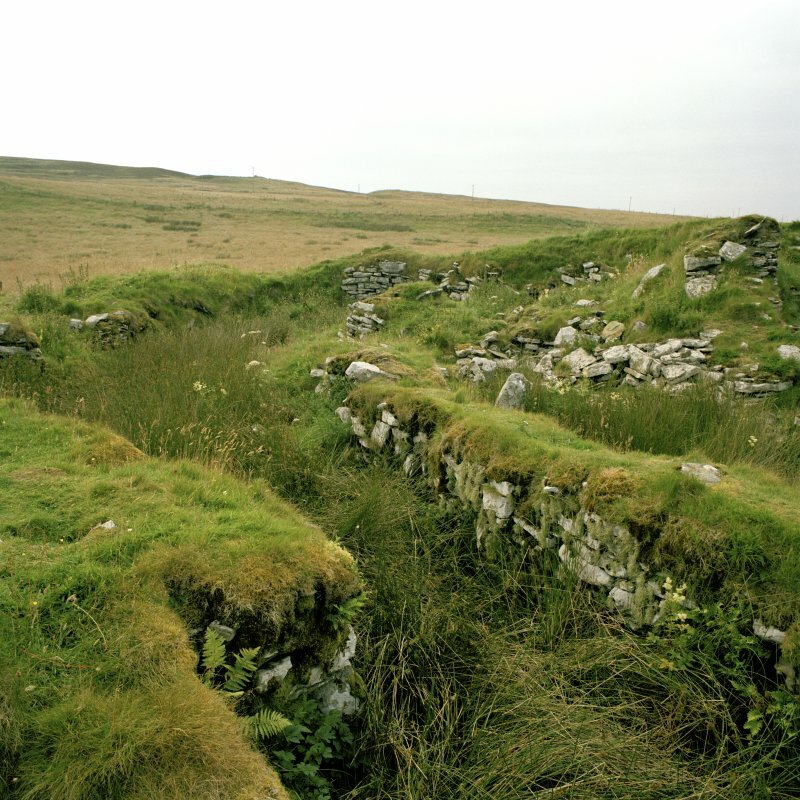 There may be traces of the Level 2 gallery hidden by turf and debris on other parts of the wallhead, particularly on top of the long stair-foot guard cell and perhaps clockwise from the present top of the stair. As noted the evidence of the landing suggests that the scarcement might have been at the base of Level 3 – perhaps 3.66m (12ft) above the primary floor – but no masonry survives at that height. Understanding the relationship of the pillared buildings immediately outside the broch is essential to reconstructing a reliable site history but the lack of systematic stratigraphical excavation makes firm conclusions impossible at present. The resemblance between the long pillared chambers C and D and the large rectangular buildings at the Forse is marked and one or two of the excavated rim sherds from Yarrows show the peculiar thick short everted rim also found at Forse. The chronological relationship of the Forse site to the brochs is not altogether clear but the possibility that it was earlier (belonging to the late Bronze and the early Iron Ages) raises the question of whether Chambers C and D at Yarrows were also earlier than the broch rather than later. The fact that longhouse C seems to be concentric with the curve of the broch wall seems to argue against this as might also the secondary doorway through the broch wall into C. On the other hand the longhouse seems to be designed either to have a second row of orthostats nearer the broch (as in the wider part of longhouse D) or to have been much narrower. In either case its northern wall could have been demolished and this suggests that it was in position before the broch was erected. The question must remain an open one but needs to be raised in case of future work at the site. 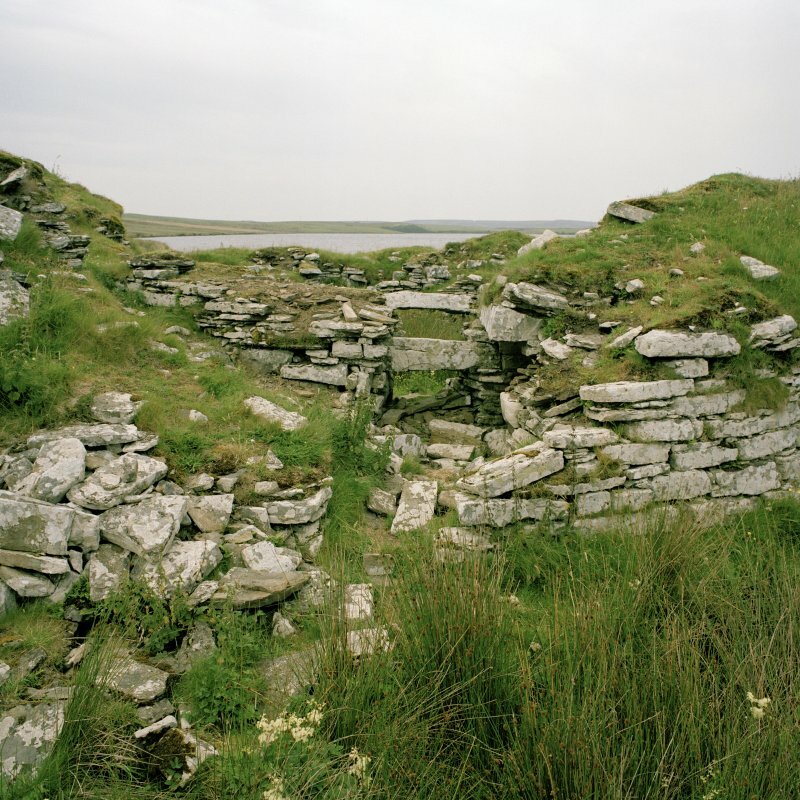 However, as Mercer points out , the fact that both broch doors lead into these pillared dwellings does imply that the interior of the tower was not only in existence but still in use when they were built. One must ask whether this is likely if they were very much older than the tower. 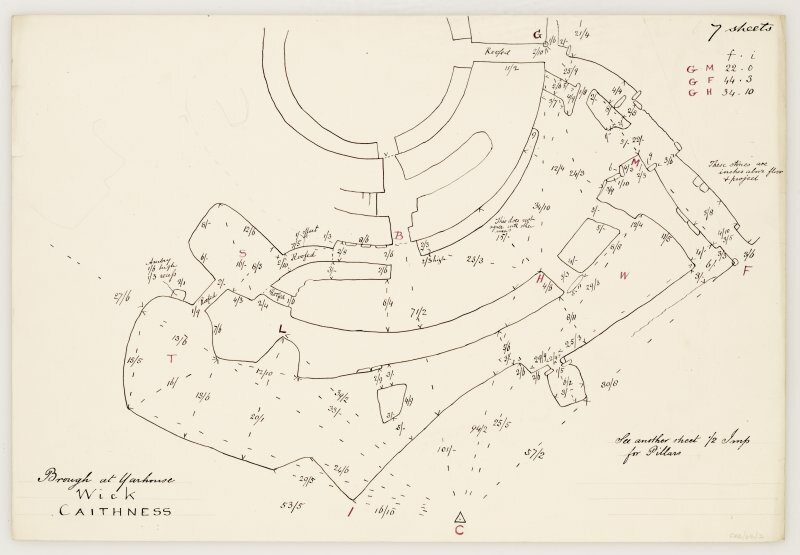 Although the dating of the occupation of the Yarrows broch, and of the various outbuildings, has to depend on analogies with other sites it is possible to infer a broad sequence of events for the site as a whole. Unfortunately, as indicated above, two quite different schemes can be proposed. This could be represented by the galleried dwellings (the 'outbuildings') constructed within a ditched enclosure on the blunt promontory. As noted there are some signs that these formed an early Iron Age settlement and were much older than the broch; some of the pottery could indicate such an early date and longhouse C might have been partly taken down when the broch was constructed next to it. 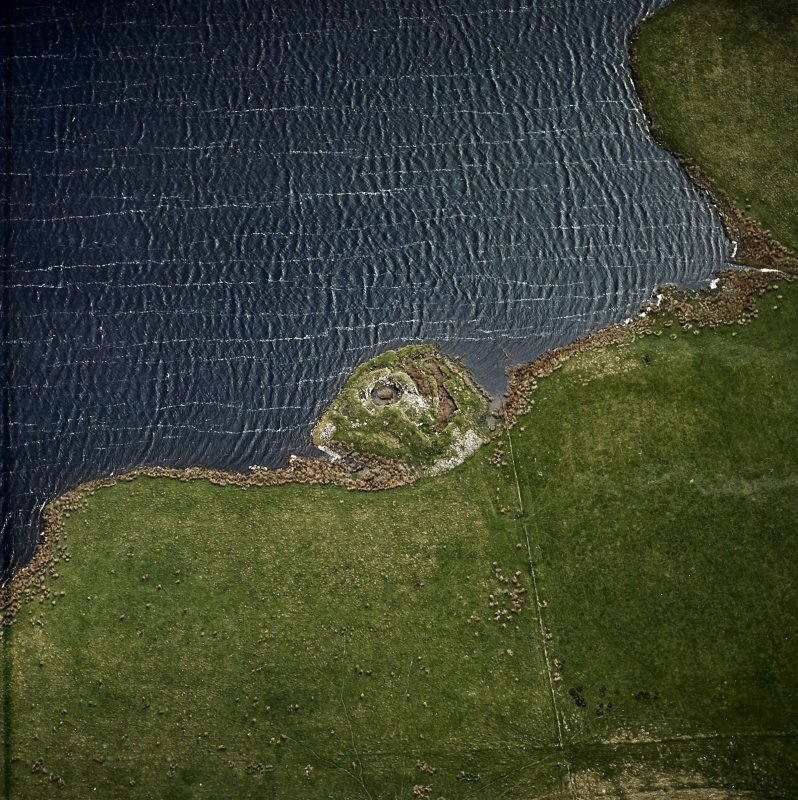 The alternative view is that the broch and its ditch represent the first human activity on the promontory and all the 'outbuildings' are later. 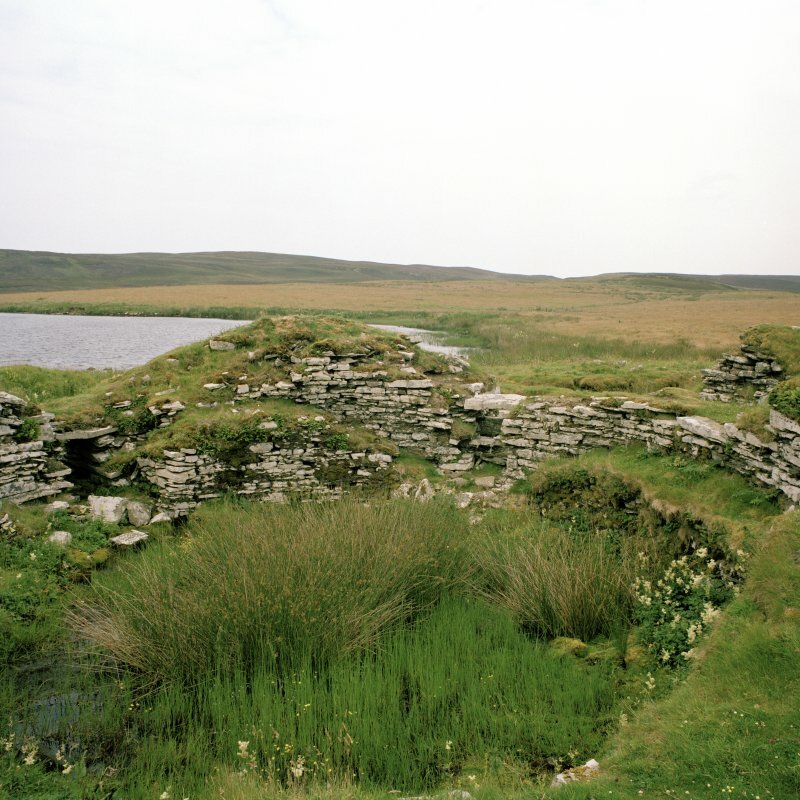 It could be argued that a broch tower – having a certain amount of defensive capacity – is unlikely to have been inserted among a clutter of pre-existing buildings some of which are quite substantial. Other arguments in favour of the 'outbuildings' being secondary are given below. If we assume that the broch stood alone in Phase 1 then Phase 2 witnessed a drastic reconstruction of the tower. 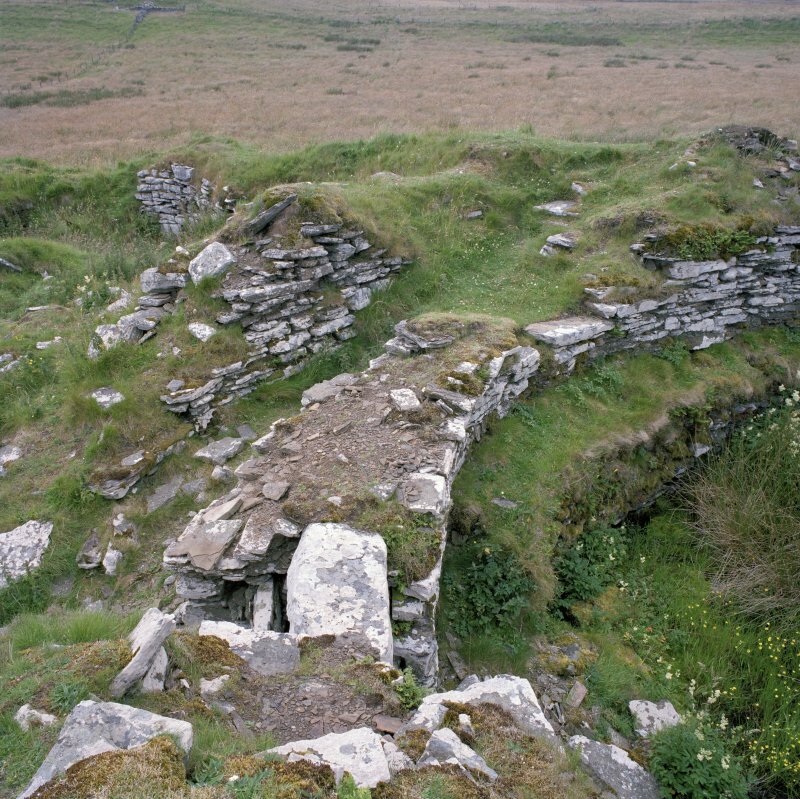 The pushing of the extra doorway through the outer part of the wall at the foot of the stair surely implies that the upper wall was taken down first – that the broch was partly demolished in fact. It would surely have been impossible, or at least extremely dangerous, to push a new doorway through the outer wall of a tall, standing sandstone broch (see Midhowe and Gurness – for the instability of such structures). However it is true that the doorway of Mousa was doubled in height at one stage without causing a collapse, though one might argue that this tower is exceptionally stable and well built, and its stone less liable to crumble. Such demolition of brochs in the Iron Age appears to have been widespread. The secondary wall built around the court implies a new support for a lower roof, so any complex wooden roundhouse associated with the primary broch phase will have already been taken down. More debris from the demolition could have been stacked around the base of the outer face of the tower. 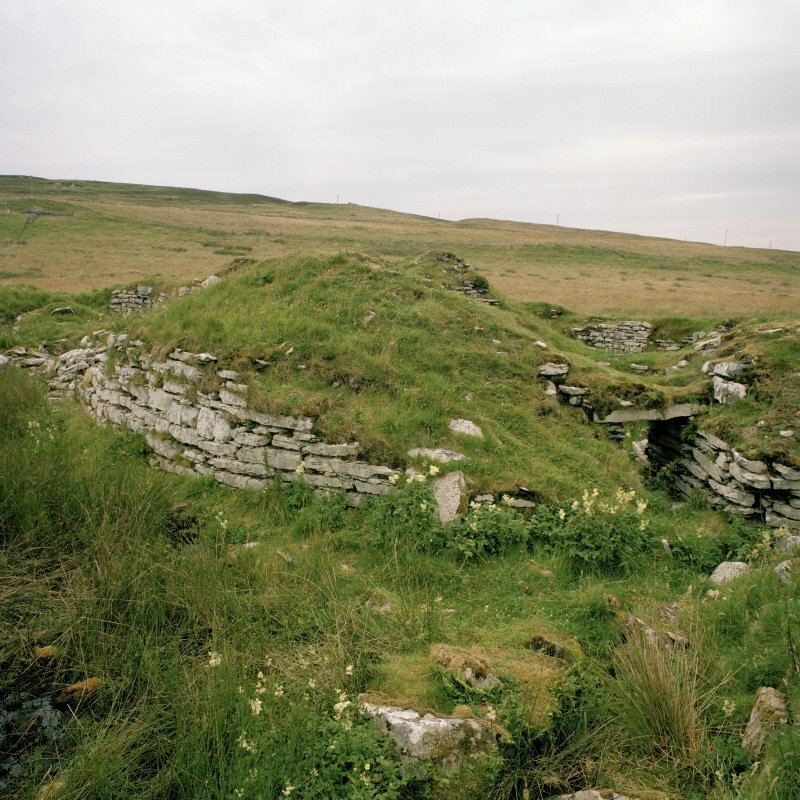 The fact that both the entrances in Phase 2 lead into chambers in the 'out-buildings' suggests that the latter were added around the demolished broch, and indeed were built with the stone removed from the tower. It has to be assumed that only a pro-portion of the pottery and other artifacts was recovered. Only the pottery need be referred to here, because – although the number of sherds is small – it does seem to represent two distinct Caithness Iron Age styles. The first is a fine ware of small, barrel- and bucket-shaped vessels with thin, hard-fired walls; this ware seems to be confined to Caithness and may go back to pre-broch times. The second style is the coarser, gritty pottery – usually called Dunagoil ware – which is widespread in mainland Scotland north of the Forth/Clyde valley and which certainly goes back at least into the early Iron Age period and probably into the late Bronze Age as well. Strikingly absent from Yarrows is any decorated pottery suggesting a link with Atlantic Iron Age sites. Bronze objects included an armlet 6.5cm (2.5in) in diameter and made of a rod which is round and unornamented for half its length and then square-sectioned and twisted: this arrangement is strikingly similar to that of the long zoomorphic pin found at Howe (site HY21 6) and there dated to about the 3rd-4th centuries AD. There was also a small ring 12.7mm (0.5in) in diameter, 1 circular, flat brooch 5.46cm (2.15in) in diameter, the band 6.3mm (0.25in) wide. An inscription on it seems to read ISVSNAZAR, or 'Jesus of Nazareth' (this brooch was found close to one of the late graves in the upper part of the broch mound). Iron objects included some fragment-ary knives found in the outbuildings. Stone implements included 2 rude mortars or basins (just irregular stone lumps hollowed out< 6 pebble hammer-stones, a fragment of a steatite vessel, 3 whetstones, 7 whorls, one decorated with concentric circles, 1 ball about 9.1cm (3.5in) in diameter with facets struck off, 11 flat thin sandstone discs, from 6.4- 30cm (2.5-12in) in diameter, and 1 perforated quartz pebble 3.8cm (1.5in) long. Anderson  also mentioned "nearly a dozen" rude stone mortars and rubbing stones, and some scratched pebbles. He suggested that these last were palm protectors for coarse needlework, having seen a fisherman using one in this way. They are now usually interpreted as strike-a-lights (see Leckie, site NS69 2). Flint: 1 small conical flint core. Pottery: the potsherds include the following types. Fine ware includes small, thin-walled, hard-fired bucket- and barrel-shaped urns of grey clay with light brown-buff surfaces (nos. 6 and 18); there is also a similar fine vessel (no. 4) which has the slightly out-turned lip of Orkney broch pottery. Two others (nos. 3 and 1) have more markedly everted rims. Coarser ware is represented by one cordoned sherd (no. 2) and by a thicker vessel (no. 19) which resembles the Dunagoil jar (see the example from Forse and from Sheep Hill on the north bank of the river Clyde (MacKie 1976, 440, Fig. 2). Animal remains included reindeer antlers  and bones of ox, horse, sheep or goat, and pig. Dimensions. External diameter c. 55ft (or 16.78m ), internal diameter 9.15m (30ft) ; the wall thickness is therefore about 12.5ft (or c. 3.81m ). The wall proportion should therefore be about 45.5%. However according to the author’s own measurements the internal diameter varies from 9.76-9.97m (32-32.75ft) (“just under 10 m” according to Mercer ) and the main, eastern entrance is only 3.43m (11ft 3in) long: the wall thickness at 9 o'clock is about 3.97m (13ft). It seems that the Commission took the overall thickness of the wall for the measurements and included the secondary facing inside. Careful measurement of the interior in 1971 showed that the primary central court has a diameter of 4.86 +/- 0.06m, which is close to a true circle (with a diameter of 9.72 m). 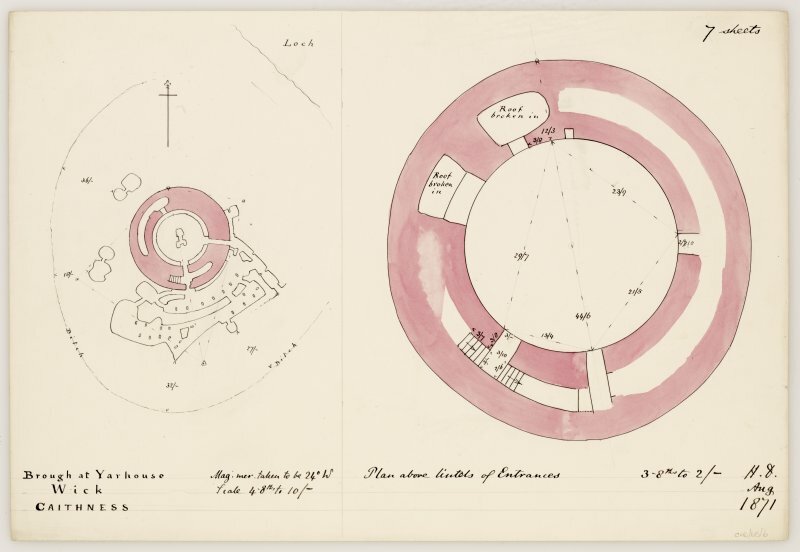 Mercer's plan shows that the wall varies in thickness from 4m near the south entrance to 3.6m at the eastern one and for most of the rest of the circumference; as in many other brochs the outer face of the wall does not therefore follow anything like a true circle. Sources: 1. NMRS site ND 34 SW 1: 2. Smith 1869: 3. Proc Soc Antiq Scot 9 (1870-2), 243-5 (finds): 4. Anderson 1883, 223-31: 5. Anderson 1890, 131 ff. : 6. RCAHMS 1911b, 149-51, no. 509, and fig. 37: 7. Mercer 1985, WAR 13 and fig. 58: 8. MacKie 1975, 227-8: 9. MacKie 1969, 11 ff [in 'The Dark Ages in the Highlands']. : 10. Baines 1999, 79 and 83: 11. Batey 2002, 187: 12. Close-Brooks 1995, no. 105: 13. Cowley 1999, 71-2.